The Bass-Reflex or Vented-Box system maintains some physical similarities with the Closed-box case; however our reader should not skip the relative section. Rear-side radiation emitted by the loudspeaker diaphragm confronts the combination of cabinet air and vent tube. Diaphragm motion needs to overcome the reaction of enclosure air volume and the mechanical load introduced by the port or vent. Enclosure volume introduces (to a good approximation) the same compliance Cme already discussed in the previous CB tutorial. Vent tubes behave to a good approximation as mass elements (Mmv), the inertia of which becomes stronger as frequency increases. Beranek some decades ago and Thiele & Small in 1971-1973 offered more accurate models for enclosures and vents, the complexity of which has been incorporated to modern software. What is interesting is that a new mass-spring subsystem is created in the back side of the woofer driver. This subsystem is based on enclosure compliance and vent mass. It has its own resonance frequency. Sound waves are transmitted through the enclosure's air and travel to the vent's inner mouth attempting to pass through the vent tube and get emitted out of the vent's baffled mouth. At very low frequencies enclosure stiffness reduces cone velocity and wave amplitude. At very high frequencies the inertia of the vent tube refuses to let these waves pass through. The figure above describes a VB speaker of net enclosure volume of 40lt with a vent tube 10cm long. It is simply the addition of the blue and the red responses that creates the overall black SPL response. Vent resonance occurs at 45Hz approx. Up to 60Hz vent's SPL is stronger than woofer's SPL. Above resonance frequency vent emission decreases rapidly. Above resonance frequency speaker's SPL is mainly due to woofer sound emission. 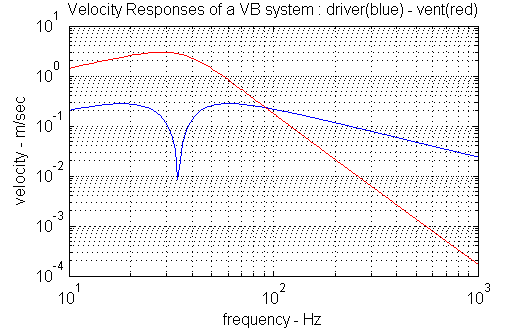 Below resonance, driver and vent SPL responses are phase reversed and cancel each other. That is why the overall SPL response below resonance is very weak and its shape features a very steep roll-off (4th order system, 24dB per octave). 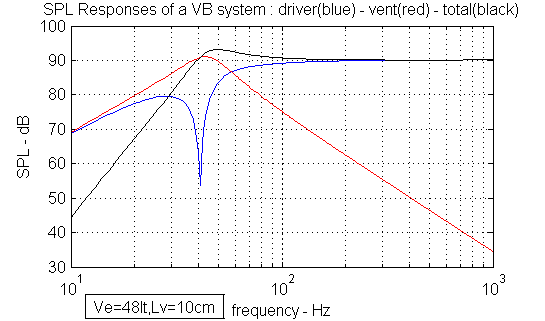 Above resonance, driver and vent SPL responses are in-phase and sum up perfectly. Overall SPL response may have a peak, either strong or weak. Its cutoff frequency along with its shape can be effectively controlled by changes in enclosure volume and/or vent dimensions. Since vent diameter is usually fixed within the baffle's hole, only changes in vent length are really an option. In the next figure a +20% increase in enclosure volume is analyzed. As expected resonance is relocated to a lower frequency (close to 40Hz). Overall SPL peak remains almost unchanged because the strength of vent's resonance is preserved. Next figure illustrates what will happen if we use a longer vent tube (18cm instead of 10cm). Resonance frequency decreases significantly. But what is worth noting is the drop in vent's SPL response (red curve). This drop straightens out the initial SPL peak. 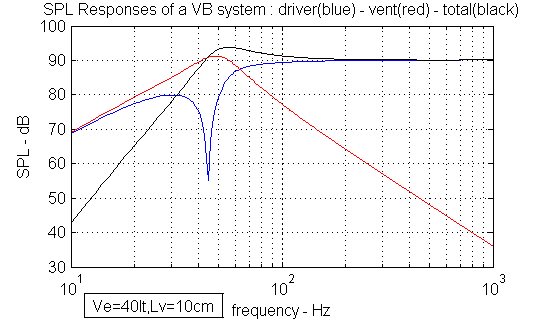 -Conclusively, how do we control the vent and driver SPL responses in a VB speaker ? Increasing either vent length or enclosure volume decreases the frequency of vent resonance. This also shifts all SPL responses to the left ie. to lower frequencies. Increasing vent length attenuates its SPL response peak. This also suppresses any peaks present in the total speaker SPL response. 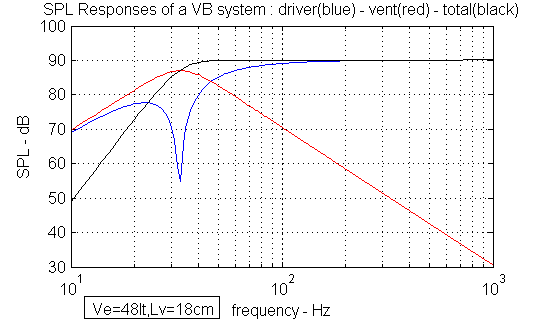 -What about cone vibration amplitude in VB speakers ? Cone excursion amplitudes are kept very low allowing for increased electric power handling. However in the very low frequency region (below vent resonance) oscillation amplitude rises to values higher than in the CB case (same woofer, same enclosure volume). This is due to the fact than in CB speakers excursion amplitude is proportional to total compliance Cmt while in VB systems it is proportional to woofer compliance Cms only. Let us elaborate on a previous example of an 8'' woofer driver (fs=35Hz, Rvc=5.7Ohm, BL=8N/A, Sd=230cm2) having suspension compliance Cms=0.54mm/N being mounted on a CB enclosure of 40lt net volume. Using the special formula to calculate the compliance of the 40lt air-volume gives a Cme value of 0.54mm/N. Applying the formula for the total compliance Cmt ends up to a lower value of 0.27mm/N. So 1 Watt of electric power (2.83V rms) at these very low frequencies will create a current of Vi/Rvc=2.83/5.70 = 0.5 ampere rms. This alternating current will create in the voice coil an alternating force F=BL*i= 8*0.5= 4 newton rms. This force will be applied to the mass spring system with total compliance 0.27mm/newton. Voice coil and cone will vibrate with an rms amplitude : F*Cmt= 4 *0.27=1.1mm which corresponds to a peak amplitude value of 1.1*1.41=1.55mm. We chose not to use an integrated formula so that we get a deeper understanding of voltages, currents, voice coil forces and oscillation amplitudes. The same procedure applied to the VB system uses driver's suspension compliance Cms instead. This is because when cone compresses cabinet's air at very low frequencies, the latter can escape through the vent's opening. So no reaction is produced by enclosure volume at very slow frequencies in VB systems. The only 'spring' force present is that of the woofer's suspension. 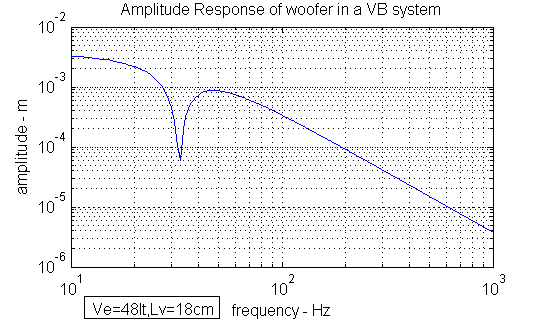 In our example repeating the calculations for the VB version of our speaker system with a woofer compliance value of 0.54mm/newton (same voltage, same current, same force) will end up to a much higher peak oscillation amplitude of 3.1mm. VB systems are less protected against cone excursion at very low frequencies.